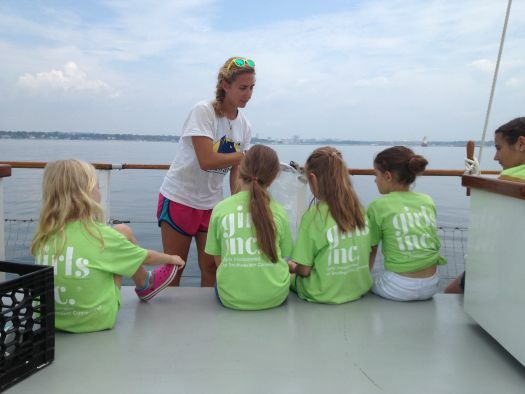 Girls Inc. of SWCT- Greenwich Summer camp girls visited the SoundWaters in Stamford and sailed the day away! While learning all about ecology and biology, the girls got to see first-hand the amazing world within our waters. The girls investigated how plants and animals survive daily environmental changes, examine macro and microscopic organisms, raised the sails and more! Sadly, the girls also got to see the negative impact of trash and other objects discarded into our waters. Armed with the tenacity that Girls Inc. girls are known for, our girls have made the commitment to keep our waters clear and safe and are actively taking on the leadership roles and spreading the word. Girls Inc. of SWCT continues to offer fun hands-on learning experiences everyday as part of their Summer Camp. GISWCT’s camp this year is chock full of field trips, speakers, activities and adventures all designed to prevent summer learning loss with fun, educational, hands-on programs. The day time camp program runs through August 23rd. Girls can participate for the entire summer or on a weekly basis. Space is limited, but new registrations are being accepted. Call 203-756-4639 or info@girlsincswct.org for additional information. Girls Inc. of SWCT was established in Waterbury in 1864 as the original Girls Club. It offers research-based curricula delivered by trained, mentoring professionals in a positive, all-girl environment. Programs equip girls to achieve academically; lead healthy and physically active lives; manage money; navigate media messages; and discover an interest in science, technology, engineering, and math. Girls Inc. is a registered 501 c 3 non-profit organization inspiring and empowering all girls to be strong, smart, and bold. For more information about Girls Inc. of SWCT after school programs and special events, contact the organization at 203-756-4639 or info@girlsincswct.org.